It's been rainy here for like, ever. It's as green as Ireland though and the birds won't stop singing so at least nature is having fun! I thought that I'd pull together a few things today based around a sunshine theme... you know if you say something enough it just may come true. Sun. Sun. Sun. Sun.... Say it with me. Sun. Sun. Sun. Not working. Well then here's a mini happy sunshine round up to chase away the floodwaters. a. 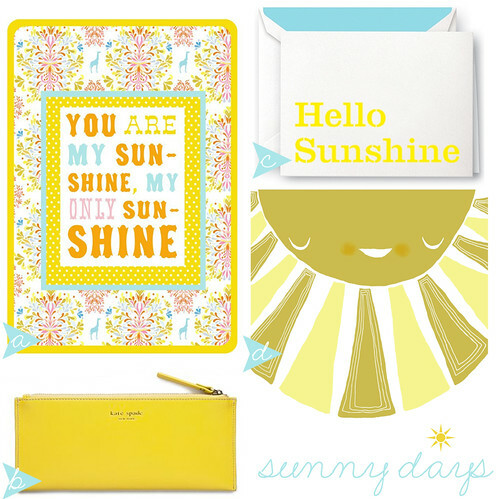 You are my sunshine print by The Wheatfield, b. Jane Street Creative Becca pencil case from Kate Spade, c. Hello Sunshine cards from Kate Spade and d. Sunshine Friend print by Laura George. Psst: This Yellow Composition Journal from Paper Source is sure to brighten your day, too.